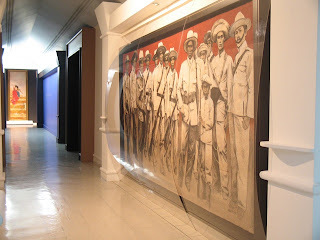 The Lopez Memorial Museum presents three (3) simultaneous exhibitions that capture the richness of our history and artistry and demonstrate our sense of nationalism. These are: Double Take, Coordinates and Tutelage. It was my first time to see the museum in 2005 when I attended an art lecture for my class in the graduate school. That was the time I saw the exhibitions entitled, "Hewn Territories" & "Destruction/ Re-construction." The museum boasts of its collection that spans several decades and even centuries of art works, archeological artifacts, maps, Filipiniana books & comics, and manuscripts that situate our country in the timeline of art masterpieces, not only in Asia but also in the rest of the world. The Lopez Museum was founded by Don Eugenio Lopez, Sr. on February 13, 1960 in honor of his parents, Benito Lopez and Presentacion Hofileña. Don Eugenio put up the museum to provide students, scholars and art enthusiasts access to his personal rare collections. To get regular updates, subscribe to the Lopez Museum's blog. There are a number of works being showcased here, mostly paintings by our national artists Juan Luna and Felix Resurreccion Hidalgo. These 2 Filipino art geniuses brought so much honor to our country as they competed in several art competitions left and right during their long stay in Spain in the 1880's. Both would always win but Luna reigned the highest winning Gold for his paintings year after year surpassing the ranks of the great Spanish artists then. [It wasn't just Gold, but First Place Gold because there would be 3 to 5 placers for Gold, Silver, Bronze and also for the Runners-up]. Included also in this exhibition are paintings by Vicente Manansala, a side-by-side video showing of two (2) films: Lapu-Lapu (directed by Lamberto V. Avellana, 1955) & Sohrab at Rustum (directed by Nemesio E. Caravana, 1950), a video installation and found objects by Raya Martin (2009), a mixed-media work of Benedicto Cabrera (1998), shields, helmets and armors used in filming for LVN Pictures, still photos of LVN Pictures, and a mixed-media painting by J. Elizalde Navarro (1998). I'm really in awe seeing old maps of the world including the Philippine maps by area or by region. It is important to note that the current map that we are using is far from the maps being drawn and measured in the past centuries. I'm very particularly interested in the places I grew up in. When I saw the 18th and 19th century maps of Metro Manila or the National Capital Region (NCR), I couldn't contain the joy I found, looking intently and capturing an image of Parañaque (not yet a city then) and Manila. Yes, Parañaque was already represented in the Philippine map in centuries past! Amazing! Included also in this rare collection are the compass and the binoculars used by Dr. Jose Rizal, our national hero. 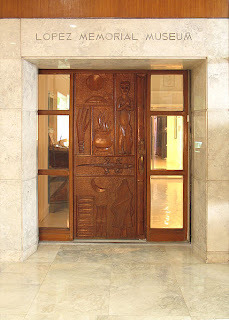 You may visit the Lopez Museum's website and explore the vast collections. This exhibition represents our nation's literary tradition through the power of the written text. Old books are on display in fiction (including children's stories), poetry and essays. One book that caught my interest is the book, Philippine History in Stories by Conrado Benitez (1928). 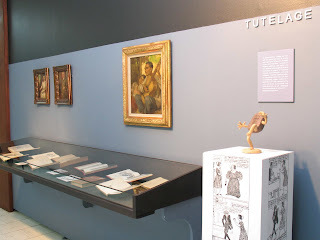 Included also in this exhibit are the paintings of Fernando Amorsolo, also a National Artist for Painting, and the sawdust sculptures of Ikoy Ricio. Amorsolo was a portraitist and painter of rural Philippine landscapes. He is known for his mastery in the use of light in his subjects. Become a fan of Lopez Museum on Facebook now. We would like to thank Mary Ann Pernia and Ricky Francisco for being our tour guides at the Lopez Museum. 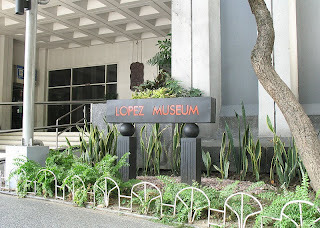 The Lopez Memorial Museum is at the Ground Floor, Benpres Building, Exchange Road corner Meralco Avenue, Ortigas Center, Pasig City 1600. Tel. No. (632) 635.9545; Telefax Nos. (632) 631.2417 and 631.2425.